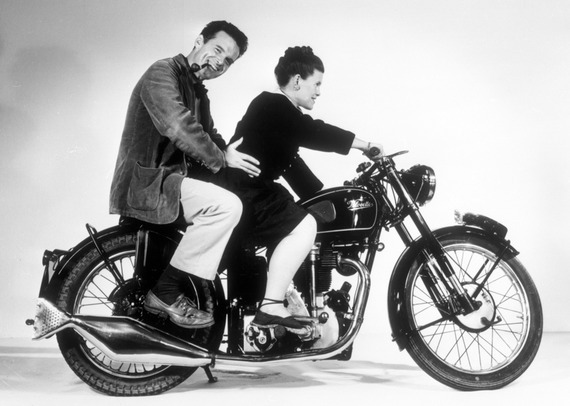 Charles and Ray Eames on a Velocette Motorcycle (1948). You can't get too far when researching collaboration before running into the powerhouse couple of Ray and Charles Eames. Widely known for their Herman Miller furniture designs, Ray and Charles made some of the biggest creative contributions to the design of the 20th Century. 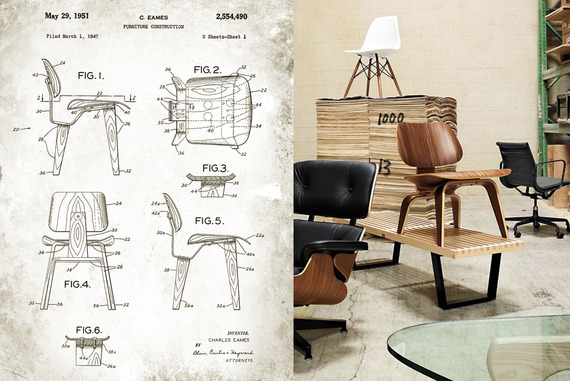 Patent for the Eames Molded Plywood Chair (left), pictured (right). Since we're fans of all things Eames (yes, we own a chair or two), we recently popped some popcorn and settled in to watch the biopic Eames: The Architect And The Painter. What really stood out to us was how Ray and Charles blended their two seemingly disparate passions. Charles was an architect. He was analytical, studied, and precise. Ray a painter. She was spirited, colourful, and inspired. Together, they were unstoppable. Together their work was greater than they were individually. While Charles worked on the technical areas of their designs, Ray added the finishing touches of creativity that launched the Eames Office forever into the world of pop culture. Being a creative couple ourselves, we are inspired by their methods. Ray and Charles fed their creativity by jumping into cinematography and photography as further outlets. Many employees in the biopic talked about the Eames Office being much like Disneyland. It goes without mention that the ability to explore different areas of creativity enabled everyone that worked at the Eames Office to really stretch their minds and learn and grow. 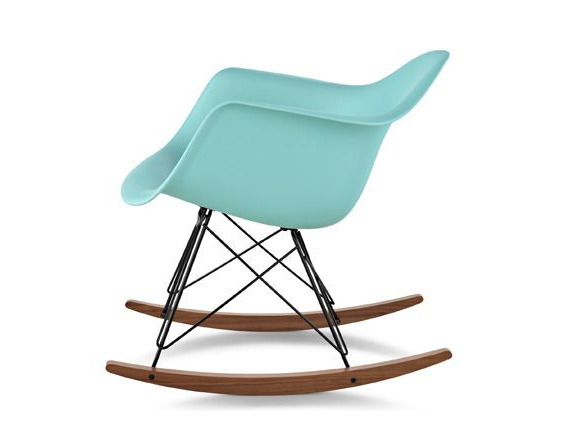 Oh, and our little boy loves Eames too. 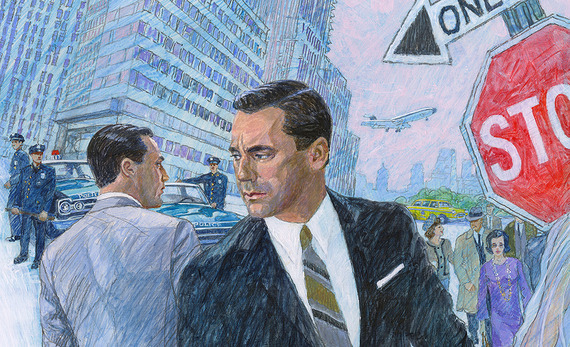 British illustrator, Brian Sanders, recreates 1960s feel for Mad Men Season 6 poster. Mad Men Season 7 is upon us. For those of you who are unfamiliar, Mad Men is set in the 1950's and 1960's on Madison Avenue where the self-proclaimed "mad men" are defining modern-day advertising. Don Draper is a self-made ad man with a silver-lined career and a personal life that often resembles a car crash. Aside from the spectacle of Don's personal life, it is always interesting to hear the ideas and pitches Don comes up with for his iconic clientele and their products. 1. "Success comes from standing out, not fitting in." Sounds just about right, doesn't it? It's easy to say, but often takes a lot of thought, insight, and sometimes courage to zig while others are zagging. 2. "If you don’t like the conversation, change it." The most important thing you can do for your business, is embrace change. Just because your branding looks a certain way or your copywriting sounds a certain way doesn't mean you have to be stuck there. If it's not working for you, change it. Don't get stuck in the past. 3. "Just think about it deeply, then forget it… then an idea will jump up in your face." Let's face it, being creative all the time is hard. As professionals we expect great ideas to flow like wine between 8am and 5pm. In reality, creativity doesn't work that way. We will often spend time in the deep trenches of an idea, thought, or concept only to come out empty-handed. The solution often comes into being outside of the confines of office hours or an official brainstorm. Ideas flow when you least expect them to. That's just how it works. Don knows it, we know it, and now you know it too. Do you have a favorite Don Draper quote? Share it!